I thought you would like to know about the fantastic work we have been doing to transform diabetes care up here in the North East. 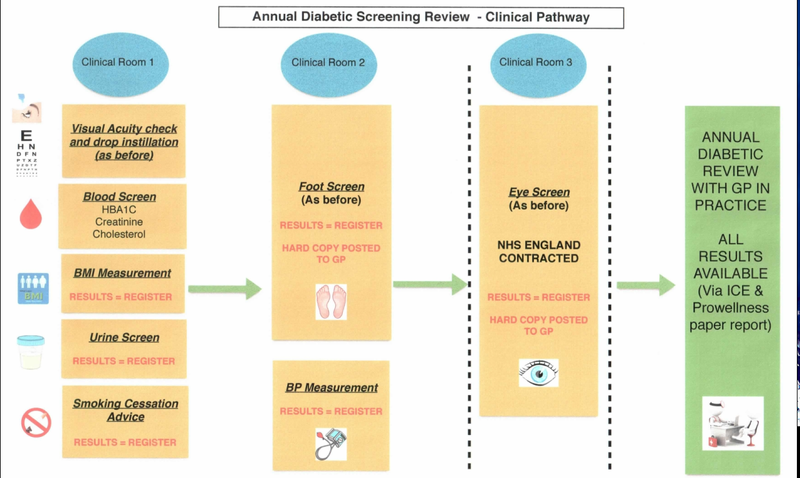 Since 2005, we've combined with podiatry services so patients have their diabetes foot and eye checks in a single appointment. That in itself is not rare for retinal screening but in April this year we launched a true one-stop service for people with diabetes in South Tyneside. The National Institute for Health and Care Excellence (NICE) recommends nine annual checks for everyone with diabetes. Until recently, these were being delivered with varying degrees of success locally with uptake for all nine checks in GP practices varying from 30% to 70% despite overall uptake of diabetic eye screening being consistently high at 84% . The more appointments someone has the more likely it is they will miss one. So, around 18 months ago, the NHS South Tyneside Clinical Commissioning Group (CCG) approached us to see if we could work in partnership to launch a comprehensive screening service incorporating all 9 checks. After a year of planning we successfully launched three new one-stop shop-style clinics on 7 April this year and the feedback has been excellent from our patients. Last month we were awarded an innovations award from our trust for improving the diabetic patient experience and we have been contacted by Diabetes UK and teams elsewhere in the country who are trying to achieve the same goal. As well as reducing the number of appointments, the new clinics have freed up GPs to spend more time planning care with patients rather than carrying out tests themselves. In addition to diabetic eye screening and foot checks, the clinics cover BMI (body mass index), blood glucose, blood pressure, blood creatinine tests to check kidney function, cholesterol checks, urinary albumin tests for early kidney damage and help with giving up smoking. We are now working with our commissioners to gather data and work out what impact we have had so far. We are confident it will be positive and that diabetic services elsewhere in the country can learn from our example.